Universally compatible with all Qi-enabled smartphones, the BOOST UP Wireless Charging Pad 5W by Belkin will power up your phone - day or night. Wireless charging is within reach with the BOOST UP Wireless Charging Pad 5W by Belkin. Compatible with any Qi-enabled smartphone, simply place your device on the pad for power. 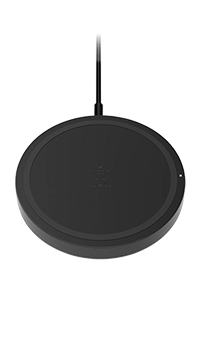 The BOOST UP Wireless Charging Pad is compatible with any device that uses Qi technology ? Apple, Samsung, Google and more. Power up overnight or keep your pad at your desk for easy and efficient wireless charging throughout the day. The BOOST UP Wireless Charging Pad will work through lightweight plastic up to 3mm thick, so you can get the juice you need without removing your case. The stylish ring around the BOOST UP Wireless Charging Pad isn't just for show. Made from non-slip materials, the ring around the pad helps keep your phone in place while it charges. Know that your phone is optimally aligned and charging with the BOOST UP Wireless Charging Pad's LED indicator. And with foreign object detection, the light goes red to tell you if something is blocking the pad from charging your phone ? like coins or a bank card.